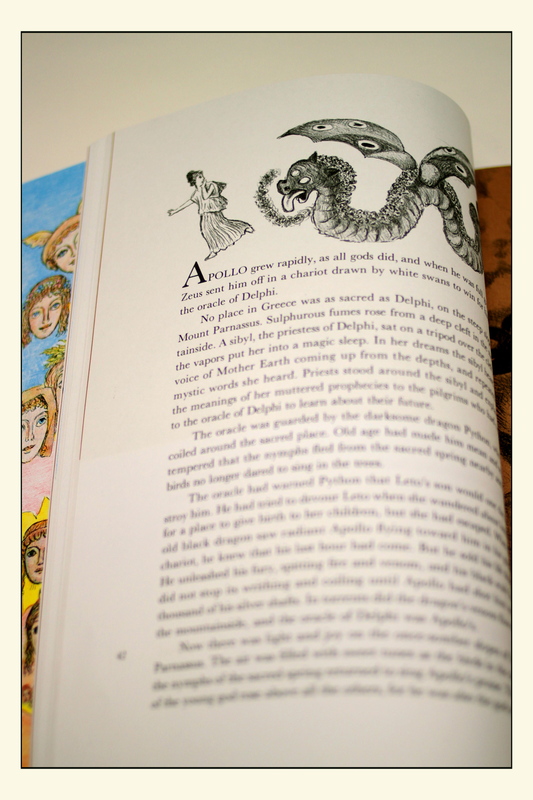 Above is a glimpse into my son’s book, D’Aulaires Book of Greek Myths. The featured page is of Apollo, The God of ‘Light’. My son has delved into the world of Greek Mythology is his Latin, Central Studies and Playmaking courses this year, and I must say his knowledge in the subject goes way beyond anything I ever learned. In Latin class Jack’s name is Poseidon, but he recently played the part of Apollo in the play, “Philemon and Baucis” written by him and his theater classmates. The set, costumes, direction and cast were brilliant, but I think my favorite part was the talk back after the show. The audience was full of questions and these kids certainly knew their stuff. I should also add that Jack looked so dapper in his grapevine wreath and carrying his gold harp! Yes Apollo,God of Light, is also the God of Music. I took this photo with my 35 mm 2.0 lens. It was a dreary day, so I opted to shoot the photo downstairs in our basement, which has lots of bright artificial light. My settings were ISO 200 , shutter speed 1/200, aperture 2.0 and my focus point was on the word ‘Apollo’. For editing, I lightened and adjusted the temperature in iphoto and then I framed in the pixlr-o-matic. It’s been one of those weeks where we just haven’t been able to dodge all the nasty viruses that seem to be prevalent at this time of year. So my picture taking was delayed, and then when it came down to it, the sun refused to come out behind the clouds. I decided that instead of playing directly with the light to produce a specific effect, such as sunflare for example, I would instead take the directive quite literally, and so here we have my interpretation of “as light as a feather”. I present my 10 year old son, Will, in front of our garage door after school this afternoon. 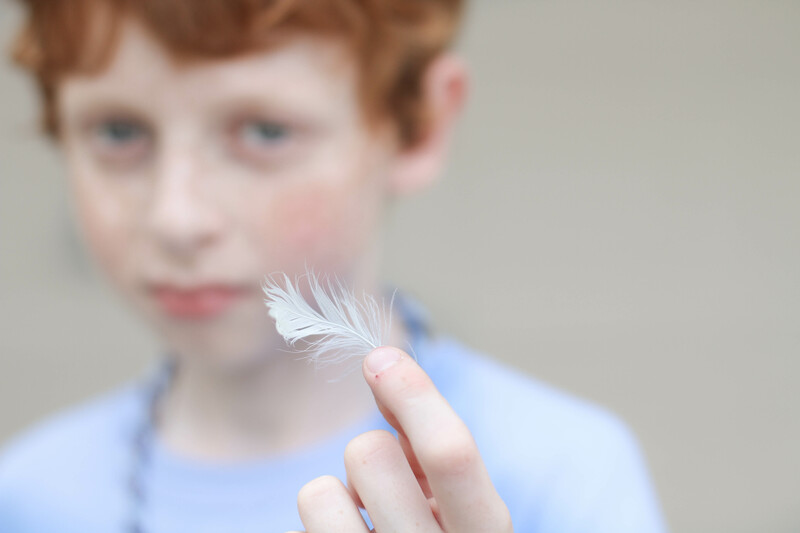 I knew that I wanted to achieve a shallow depth of field, which would enable me to produce the the feather in sharp focus, and leave both Will, and the garage door behind him, out of focus and blurry. I love the creamy bokeh that this achieved. To attain this, I used my 50mm 1.4 with a very small aperture, at f/2.2. I felt that at f/1.4, Will’s feature were a little too indistinct. Even though it was overcast, the light was still bright, so my ISO was set at 100, at my shutter speed was 1/400. Post-processing in Lightroom 4 was fairly minimal. I increased the exposure a little, and then used a preset brushstroke from Pretty Presets for Lightroom, which produced a gradual warm haze.